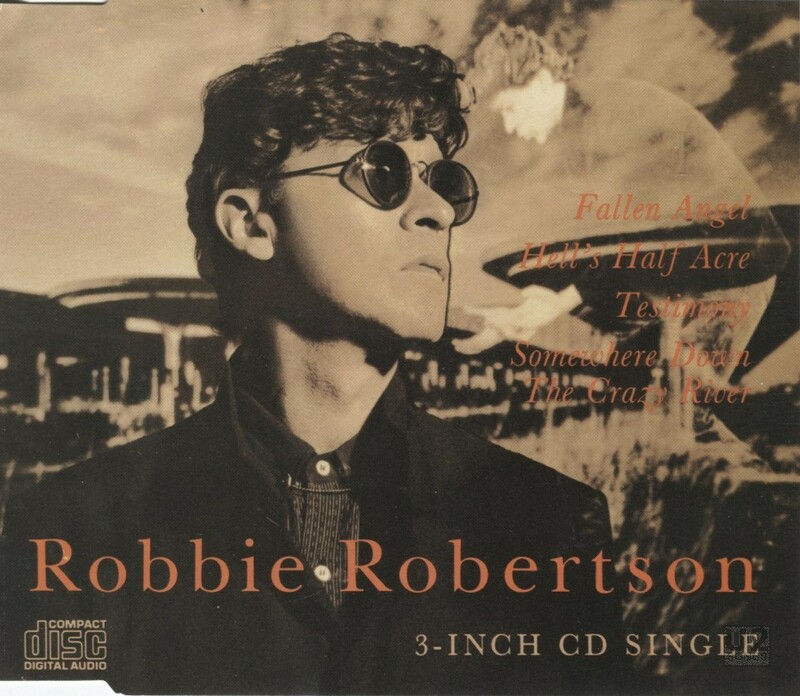 In early 1988, to promote the album “Robbie Robertson” the single “Fallen Angel” was released. On the 3”-CD single released in France (GEF 46 CD), and the 12”-vinyl single released in the UK (GEF 46T) one of the extra tracks was a remix of the song Robertson had done with U2, “Testimony”. It is labelled here as “Testimony (Remix)” and does not contain any information about the song other than to refer to the album version. The remix is most likely remixed by Nile Rogers here, who is not listed on this single, but was identified in the credits for 2006’s release “Robbie Robertson / Storyville: The Expanded Edition”. Other 12”-vinyl singles were released, only the above mentioned singles contain this remix version of “Testimony”. “Testimony” was recorded at U2’s Danesmote Studio they had set up to record “The Joshua Tree”. Robertson arrived in Dublin at the end of August 1986, as did Hurricane Charlie. “There were cars floating down the streets, it was really frightening. Thank God these guys (U2) were up for some spontaneous combustion!” remembers Robertson of the recording sessions. The album, “Robbie Robertson” featured the original recording of “Testimony” as well as a second song completed with U2 during those sessions, “Sweet Fire of Love”. Testimony: Drums: Larry Mullen Jr. Bass: Adam Clayton. Guitar: The Edge. Background Vocal: Bono. Bass, Percussion: Daniel Lanois. Guitar: Bill Dillon. Background Vocal: Ivan Neville. Gil Evans Horn Section: Arranged by Gil Evans assited by Peter Levin. Vocal, Keyboard, Guitar: Robbie Robertson. Produced by Daniel Lanois and Robbie Robertson. Recorded at U2 Mobile Unit, Danesmote, Dublin Ireland. Mixed by Bob Clearmountain.